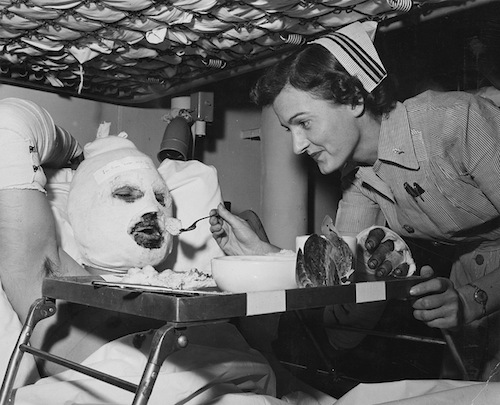 During the Korean War, which ran from June 25, 1950 until July 27, 1953, nurses performed vital and heroic functions often above and beyond the call of duty. Not only did they carry out regular nursing roles, they also sutured injuries, triaged patients without the help of a doctor, set up blood transfusions, administered antibiotics and made sure that medical supplies were kept in stock. They were innovative when supplies dwindled and administered quality health care despite the enormous amount of casualties. These nurses made a difference in the lives of thousands of servicemen, and the following 10 snapshots offer a behind-the-scenes glimpse into their lives during the conflict. This photo was taken aboard the USS Repose on November 27, 1952. 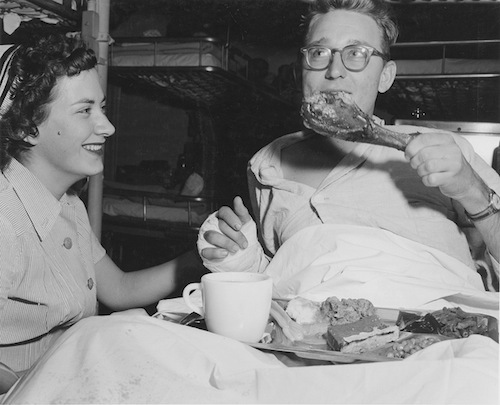 Lieutenant junior grade (LTJG) Caldie Green of the US Navy Nurse Corps is shown helping Corporal Richard Hollander eat his Thanksgiving meal. Now that’s service with a smile! This photo was also taken aboard the USS Repose, this time on Thanksgiving Day 1952 in Incheon, South Korea. Pictured above is LTJG Weece Wood of the US Navy Nurse Corps with Private first class (PFC) Jack Newman. Despite the difficult circumstances of war and the stressful conditions, Wood is shown spreading joy and cheer. There was a general shortage of qualified nurses during the Korean War, so the Navy swelled its ranks by calling on reserve nurses from WWII. Civilian nurses were also brought into service, and some were placed aboard hospital ships such as the USS Repose. 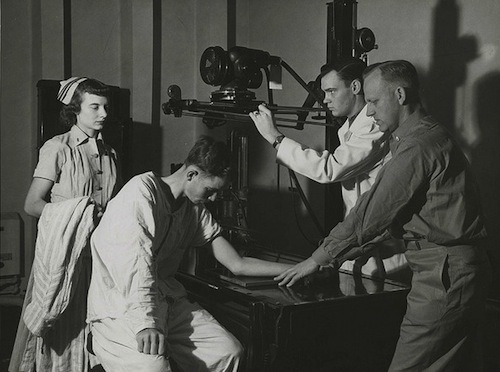 The scene above shows PFC George E. Anthony about to have his arm X-rayed. Nurse Lieutenant Rita Camp is ready to offer support, while X-ray technician Harry Palo prepares the equipment. Commander Bruno Junnila can be seen on the right. The photo gives us a glimpse of life aboard the hospital ships, and some insight into the quality of care servicemen received (although you’ll notice that no-one in the photo is protected from the X-rays). 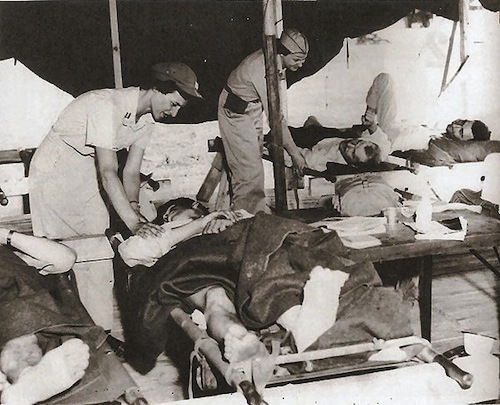 Here we see nurses tending to wounded servicemen at the 8055th Mobile Army Surgical Hospital (MASH). This picture was taken in August 1950, just one month after the hospital arrived in Busan, South Korea. Arriving on July 6, it was the first medical unit to reach the country. Some MASH units received up to 1,000 casualties a day, and although the surgery was crude at times, 95 percent of the casualties admitted to the hospitals left alive. Dr. Dexter Ball, who served in two different MASH units between 1950 and 1951, says that his unit was constantly moving with the frontline – amounting to 12 location changes in a single year. 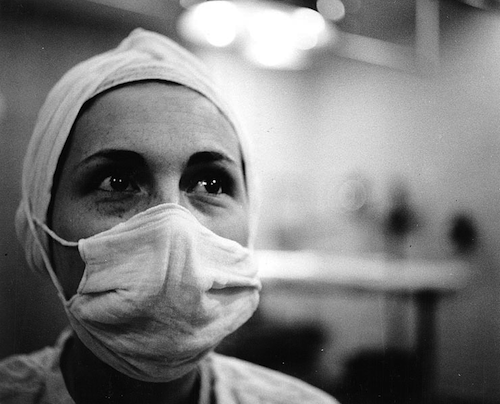 MASH units (at least in the beginning) only accepted patients who needed emergency surgery. 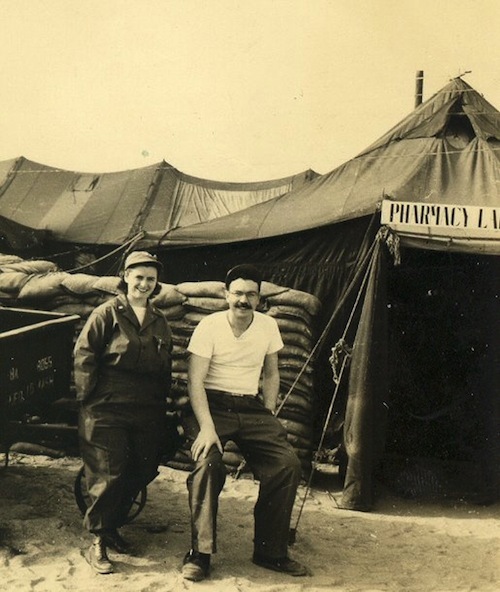 In this photo, we see Dr. Harold Secor from the 8055th MASH unit and a nurse taking some time out to relax. Milton Weinberg, another member of the 8055th, explains that the unit was not always busy. There were downtimes, during which they relaxed or read books, and “sometimes the nurses would have a little dance.” Medical equipment and conditions were generally adequate, even though procedures were carried out in tents and the surgical tables were nothing more than stretchers on trestles. Of course, sometimes there were so many casualties that staff were kept working at a furious pace. Julia Baxter worked in a MASH unit as an operating room nurse and says that at one point there were so many wounded soldiers waiting for care that they had to extend their shifts. “We worked eight hours on and eight hours off for about a month before changing to 12 hours on and 12 hours off,” she remembers. The US wasn’t the only nation to operate MASH units. In July 1951, Norway’s Red Cross unit, the Norwegian Mobile Army Surgical Hospital (NORMASH), arrived in Korea. Beginning active duty on July 19, NORMASH operated until November 10, 1954. During this time the unit serviced a total of 90,000 patients, including American, Canadian, British and South Korean troops, as well as North Korean and Chinese prisoners of war. 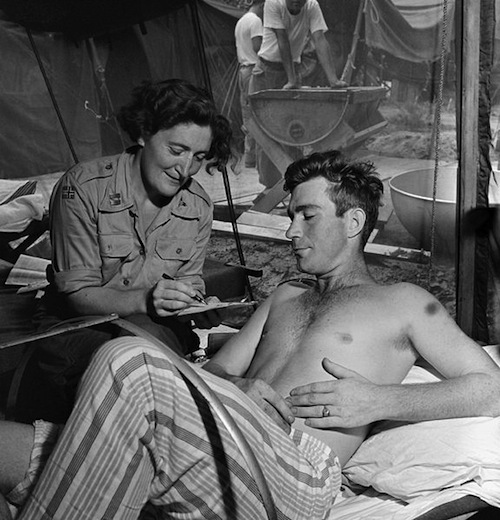 Above, Norwegian nurse Captain Petra Drabloe treats Canadian soldier Lance Corporal M.R. Stevens, who was injured in a gas explosion. 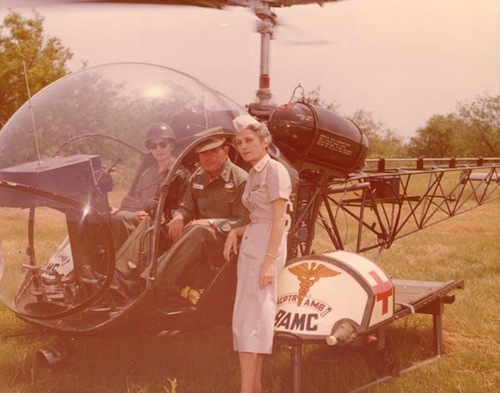 This early 1950s photo shows Colonel Agnes Maley of the US Army Nurse Corps posing with a helicopter crew. Although air ambulances had been used in previous conflicts to transport casualties, it wasn’t until the Korean War that the US used dedicated helicopters to carry the injured from the frontlines to field hospitals. They also transferred patients from field hospitals to hospital ships for additional care. According to the National Museum of the US Air Force, the aeromedical evacuation system, in conjunction with other factors such as antibiotics and modern surgical methods, reduced the number of deaths from injuries by 50 percent compared to WWII. Pictured above is Captain Lillian Kinkela (later Keil). In 1938, Kinkela, a trained nurse, began her career as a flight attendant with United Airlines, before becoming a flight nurse during WWII. Described as an “airborne Florence Nightingale,” she served on 250 evacuation flights throughout WWII and 175 during the Korean War. Kinkela carried out the crucial work of caring for patients while en-route to medical facilities. During the Korean War, there were just 30 Air Force flight nurses in the entire Far East, so Kinkela was something of a rarity. 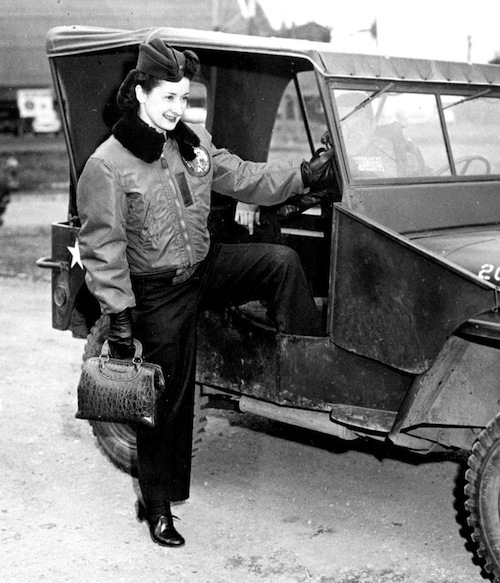 However, the fact that she is one of the most decorated women in US military history attests to the vital importance of her role. 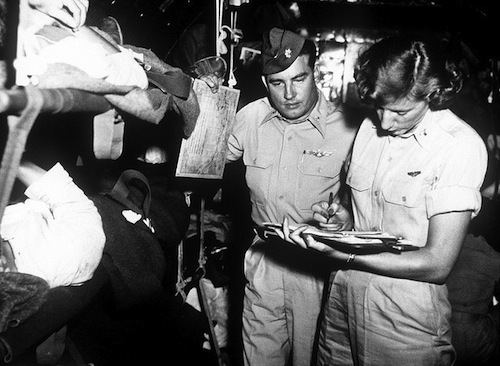 Flight nurse First Lieutenant Victoria Malokas is shown here with C-54 aircraft commander Major George Cichy, looking over patient records in October 1952. In general, conditions in Korea were harsh. The winters were freezing cold and the summers were scorching. Add to that the stresses inherent in the job – such as accommodating 200 soldiers in a MASH that was only designed for 60, or scrounging for supplies – and it’s easy to imagine how hard the experience must have been. Still, in the midst of these grueling circumstances (to which the nurses responded heroically), there was some time for fun and laughter. 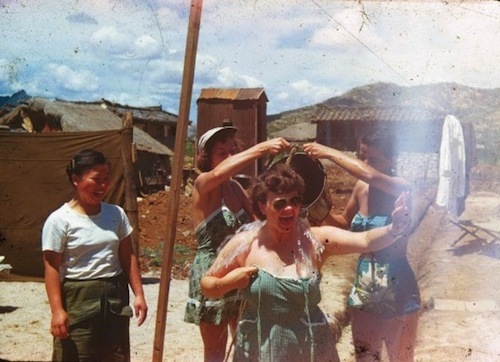 Above, dressed in stylish ‘50s bathing suits, three Army nurses douse each other with buckets of water to cool off in the heat.